Zhuankou Yangtze Bridge, the widest bridge over the Yangtze River, opened for traffic on Thursday. The bridge, with eight lanes, is the ninth bridge over the Yangtze in Wuhan, capital of central China’s Hubei Province. Excluding the highway on both sides, the bridge itself is 1,510 meters long and 46 meters wide. 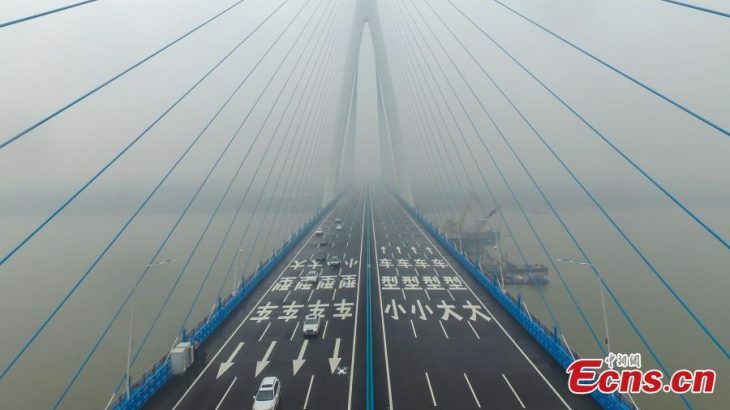 Costing 5.2 billion yuan (about 780 million U.S. dollars), the bridge will be the main road for trucks crossing the river. News, Translations Bridge, Wuhan, Yangtze. permalink.